Award-winning historian Chidester (Comparative Religion/Cape Town Univ.) 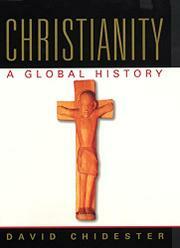 offers a comprehensive history of Christianity—from Bethlehem to the First Church of Cyberspace (a worship Web site). The author aims to “provide engaging and challenging occasions for thinking about Christianity”—and, for the most part, he succeeds impressively. He begins in Roman-ruled Judea, just before the birth of Jesus, noting that “eating and drinking in the presence of a divine being” were significant activities in the Roman religion and were soon integrated by Christians into their celebration of the Eucharist. Chidester retells the advent stories (reminding us that the earliest gospels were not composed until about 70 a.d.), follows the exploits of the apostle Paul, chronicles the establishment of the early church (which was not a building but “the act of gathering together for a ritual”), and describes the original rite of baptism (which required the converts to remove all their clothing). It was Constantine (ca. 273–337), the first Christian emperor of Rome, who was greatly responsible for the rapid spread of the religion. In subsequent chapters (as thematic as they are chronological), Chidester examines the evolving Christian conceptions of heaven and hell, the church’s emerging “military mission” in the middle ages, the significance of relics and icons, the scholarly debates that divided the church, and the pursuit of heretics and witches. After a thoughtful discussion of Martin Luther and the Reformation, Chidester globe-trots a bit, showing how Christianity reached its farther shores, how it changed people and was in turn changed itself. He gives an unblinking account of the effect of the Holocaust on both Christians and Jews, noting that it “challenged the notion that God could be both all-good and all-powerful.” Chidester strives throughout to maintain a disinterested tone and only occasionally emerges from it—e.g., he gently points out a moment of hypocrisy in the Falwell ministry. Solid and scholarly, surprising and sobering.